Yesterday was Mother’s Day. It was a special day for me, filled with Mother’s Day well wishes from my children, fiancé, ex-husband, mother, other family members and friends. The children, Sean, and my mother provided lots of love, flowers, and thoughtful gifts to recognize the day. And, as a bonus gift, Monkey dressed in pants and a collared shirt for our lunch out. I had countless Mother’s Day wishes from friends on Facebook and Twitter as well. Overall, it was a wonderful day that even involved an afternoon nap. 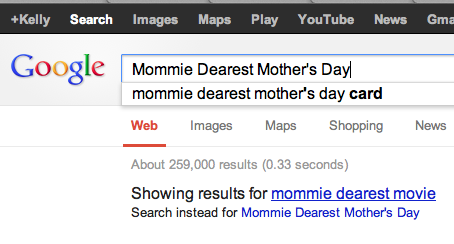 Then, after all the Mother’s Day love, Google told me I am a bad mom. It’s been building, actually. First, there were a few clues by mid-week last week what Google thought of me. Then, to make sure I got the message, Google screamed at me the last couple of days, “Hey, Kelly–we are letting the world know just how bad you are.” Over and over again. To have good table manners. We don’t use bad words. Additionally, I am ensuring they are having an enriching, fun-filled childhood. There’s endless content from which Google could share with the world what a great mom I am leading up to, and on, Mother’s Day. What does Google do instead? Google compared me to Joan Crawford when people were doing searches leading up to Mother’s Day, sending me tons of traffic. I am now awaiting the knock at the door from child protective services. LOL, I guess it’s true what they say ‘there is no such thing as bad press’. SOunds like you had a wonderful day and much deserved! Thanks, Lisa! The comparison to Joan Crawford has continued past Mother’s Day! So, who is this Google dude anyway? Forget him! You rock, darlin. Keep up the Mothering and don’t let the critics get to you. By the way, Google can’t even tell me; what is the favorite chocolate of Texas Jackalopes? Really? Fail! Yes, what does Google know anyway? Right, Jack?